What software development activities and expenditures can be included in an R&D Tax Credit claim for software projects? 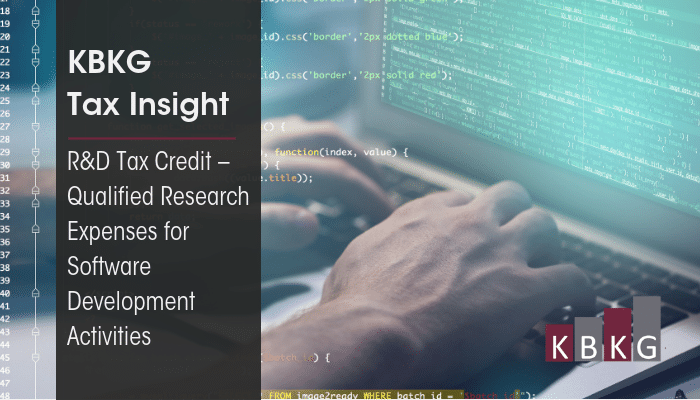 Companies performing qualified research in creating or improving their software may qualify for federal and state R&D tax credits for the software development activities they are already conducting. These credits are a dollar-for-dollar reduction in federal and state tax liability and could range from 6.5 percent to 15 percent of total research expenses. For example, a company employing 10 software engineers with qualified wages of $1 million could see federal and state R&D credits exceeding $100,000 for a single tax year. Below is a short list of qualified activities and the expenses eligible for the credits. What R&D expenditures can be claimed for software projects? 1Treas. Reg. § 1.41-2 Qualified Research Expenses. Subscribe to receive KBKG Tax Insights right in your inbox.